Gate Gourmet is the world’s second largest catering company for airlines with more than one hundred locations. It has 22,000 employees working in 29 countries. Gate Gourmet is the paradigm for how capital tries to squeeze the most out of workers. 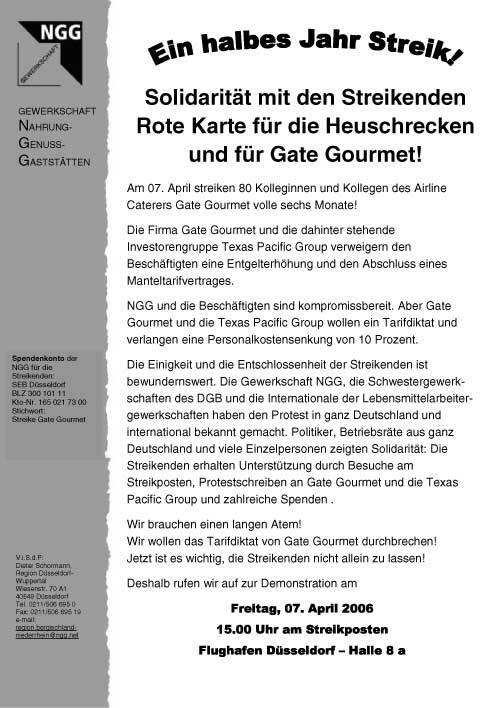 In 2002, Gate Gourmet was bought out of the bankruptcy assets of Swissair by Texas Pacific Group. This investment and buyout in particular triggered the so called debate in Germany about „locusts“, i.e. firms that only by other firms for a short period of time to squeeze them out. The strategy of such private equity companies is to sell the firm within a few years with an enormous profit margin. In order to realize it, they send management consultants, like McKinsey, into the firms. They use measurement with stop watches and standardization of work practices to speed up the work and intensify the workload in an extreme way. Companies like Texas Pacific Group show us how modern capitalism operates. Established structures and connections of the workers are destroyed systematically. In London Heathrow, management quite openly declared that it didn’t want to work any longer with its workforce; ninety percent of which consisted of Asian workers. The workers resisted stubbornly against the new, tightened work practices. That was the reason why nearly 800 workers were sacked at 10 August 2005 and displaced by temp workers from other countries. In Düsseldorf, workers tolerated an extreme increase in productivity for two years. Work was “flexibilizised” in a way so there wasn’t much social life left for the workers. The anger of the workers at this treatment is what supports their strike, which at April 7 they will have conducted actively and decidedly for half a year. The strikers express the aim of this struggle in one single phrase: “Human Dignity!” This struggle is not about a few percent increase in wages but, in a real essential way, about the question “How we can assert ourselves vis-à-vis the excessive claims of the capital owners and bosses?” Gate Gourmet concerns all of us. The Gate Gourmet workers from London and Düsseldorf have build up contacts and got to know each other. They have visited and bolstered each other. They know that one single workforce can not win against Gate Gourmet or Texas Pacific Group. But these companies are all over the world. At all locations they impose pressure upon the workers to increase productivity and profits. Texas Pacific Group is not responsible for the terror of speed ups at Gate Gourmet alone – it has rolled up the German company Grohe (bad products and fittings), it controls Burger King, it bought into Mobilcom, and the list goes on . . . The action day at 7 - 8 April 2006 is for support of the still ongoing struggles at Gate Gourmet in London and Düsseldorf. We also want to find out at which other Gate Gourmet locations workers are resisting this tightening and we want to build up links between the workers. The decidedness of the struggles in London and Düsseldorf reassures all of us to no longer accept the dictatorship of money and profits. Distribute leaflets at Gate Gourmet locations or the airports! Ask questions and learn from the workers! Get information about their situation and support them in their resistance! Actions with publicity effect or direct actions have the impact to build up pressure against Gate Gourmet and Texas Pacific Group. that there is a global worker’s struggle!